There’s something incredibly satisfying about destroying things, so playing as a hole in the ground that grows larger and larger as it swallows up an entire town is particularly gratifying. 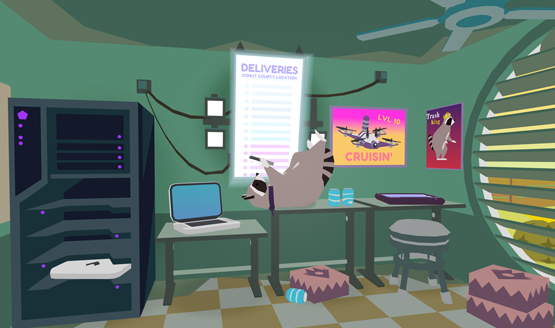 Donut County is a unique puzzle game that stars BK, a raccoon messing around on his tablet playing a game where he moves a hole around to swallow things up. Except that hole isn’t just in his game. It has begun to swallow the town around him while BK remains seemingly clueless, continuing to play on his tablet as the citizens of Donut County recount their tales of alling into the hole. The trailer above gives a great snippet of the art style and overall attitude, but the satisfaction of dropping things into a hole has to come from playing the game itself. It’s truly addicting. 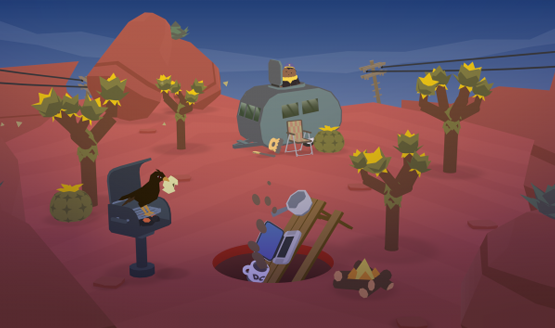 In what is the sheer opposite of something like Katamari Damacy, where the goal is to make the mass bigger, Donut County is all about making the nothing, the void, the hole, bigger. It’s about the town that falls into that hold and lives 999 feet below the surface. The hold begins small, gobbling up pebbles and plants, before progressively getting bigger and eating the environment around it. Buildings, vehicles, trees, and residents of the town become nothing more than food for the hole, and you, the player, continue in the addictive nature of finding a way to fit everything on screen inside. BK the raccoon can’t get off his mobile device and it’s sure to cause the destruction of everything around him. Donut County seems simple at first glance, but the demo I played at PSX showed off some interesting puzzles. In one early puzzle, there’s nothing small enough to fit down the hole, so I had to eat a kiln and use the fire to raise a hot air balloon. This pulls on some cables which breaks the nearby rocks into smaller pieces that I could eat up. Another area puts snakes into the hole (along with some hilarious physics trying to get them there), and using the end of their tails that protrude from the hole, you can solve additional puzzles. In the end though, it’s all about growing the hole big enough to swallow everything on the screen. These simple pleasures are enough to make Donut County extremely addicting and endearing to play. Bright contemporary visuals and a bouncy soundtrack play in stark contrast to the amount of destruction being caused as the holes swallow the people and places in town. The physics are the particularly hilarious part. Most things don’t just fall straight into the hole. Something that’s a little too big on the bottom may need to be tipped a little bit before it will upend and fall down. The snakes wriggle around and pop out of the hole, making them particularly tough to catch. With the couple of puzzles I saw in this demo (and even more featured in a few of the game’s trailers), the full game is sure to add interesting mechanics and things that make Donut County about more than just filling a hole. You may need to tip things to get them to fit and fall into the hole. There’s something deep about Donut County, and it’s not just the hole. It plays into satisfying the simple pleasures that make us human while presenting a kind of message that goes much further down. The raccoon addicted to his mobile device and subsequently causing the destruction of a town is a pretty obvious one, but there are hints of other themes, such as a hole that grows bigger and demands more the more it swallows. Even if it is trying to tell me something about the unquenchable nature of addictive behavior, Donut County is a game that I can’t wait to fall into again when it releases next year.